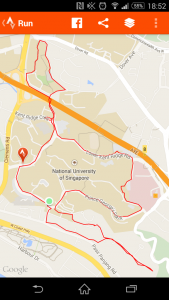 Race Review: NUS Bizad Charity 2015 [10km] (by 'sinaistrider') | JustRunLah! 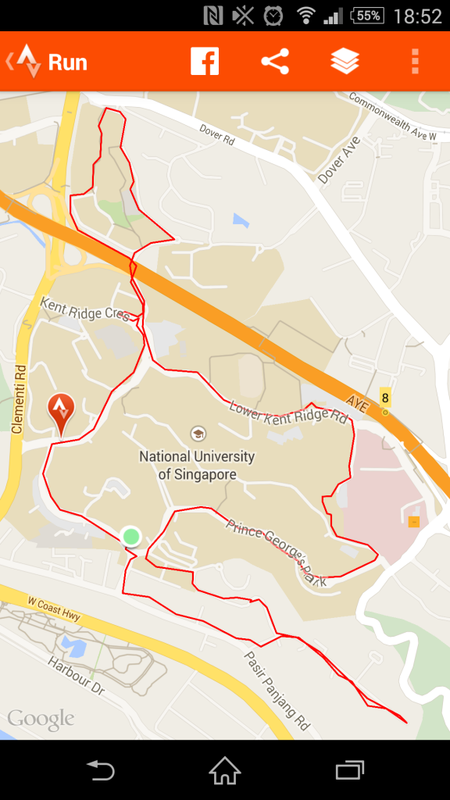 My first race outing of 2015, and it’s on local turf, the NUS Campus at Kent Ridge. 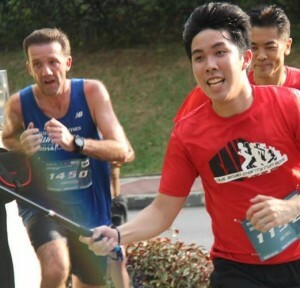 When I talk to running friends here about this race and it’s mid year sibling, the NUS 10k, three themes are apparent. 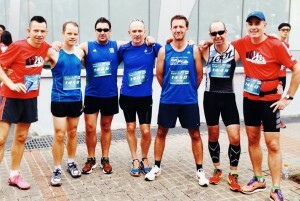 As well as being the first race of 2015, this was also a big group race for the Mount Sinai Striders. Out in full today, were Ben, yours truly, The Claw (testing out his new calf guards), Scouse Pete (fresh back from a UK christmas and new year), Shaun (last race in SG) and big rob (PB hunter). Shug still has his ITB issues, but has jogged down to watch the race along with Big Rob’s family. We meet fellow regular runners Al, Popeye and Olive on the start line. 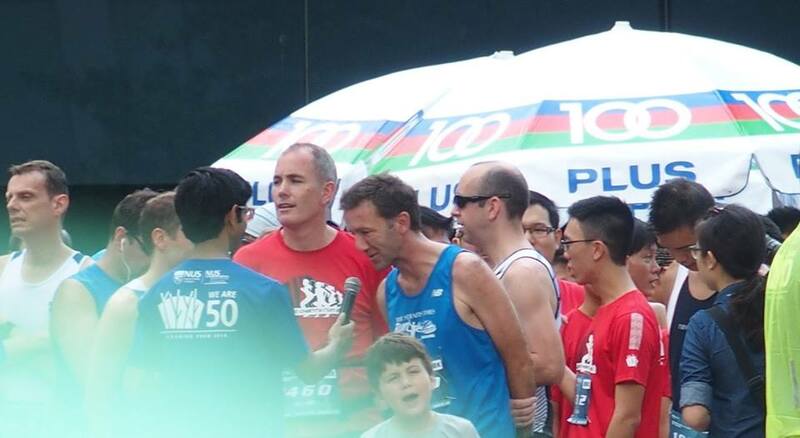 Ben and I are interviewed by the race announcer the start line, we impart some words of wisdom to the gathered runners “embrace the sweat” and “watch those hills” and then after waiting until 15 mins after the flagoff time for a dignitary who didn’t show up, we were flagged off. All of us in the leading pack remembering point 2 above (dont lead) set off at a pretty slow pace, like one of those tactical Olympic 800m finals where they jog the first lap, waiting to see who is going to surge first. Popeye has a fairly short fuse at NUS events, we’ve only been running 10 minutes and he’s exploded twice already. But the fun is just beginning. On the footpath over the AYE into U Town and we encounter a hand holding couple, walking towards 8 sweaty runners at full tilt. They do what comes naturally and make no effort whatsoever to accommodate the race, so we all rapidly make single file to squeeze past them. Round the U Town loop, which is sufficiently obvious that no marshalls can misdirect us. 5k in now and the pack has spread a bit. Alistair is in front, with Ben in third, Popeye in fourth and me 6th. At this point we merge with the 5k fun runners and the pavement weaving skills come into full use. Through 6k, we turn a corner and are presented with a 50m staircase. Aiyoh! at this stage of the race it may as well be 500m long. Single file up the stairs, pretty much everyone walks at some stage as the lactic acid build up gets too great. The one great thing about hills, generally speaking, is that once you get to the top, you are rewarded with a lovely downhill section. This was no exception and the next k or so was a fabulous downhill blast. Here I caught a little time on Popeye and Ben, but not enough to change the placings. At the bottom of the hill, somehow Popeye has gone the wrong way again and he’s behind me, but he’s quite highly charged by all the misdirection, which seems to have fired him up and he steams past me into the last 2k. 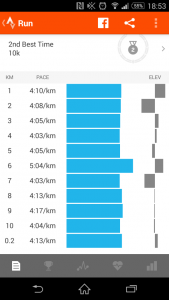 At this point, I can hear the familiar footfall of Olive, Popeye’s very speedy female companion – last saturday I fended her off at the ParkRun over the last kilometre but it was hard work, so I know she’s going to make me work again here. This time she draws level, we acknowledge each other, then she pulls ahead. Onto the last section on Pasir Panjang Road and into the last click, I summon some inner strength and knuckle down to the task of trying to catch her, this i just about managed, but honestly it was only courtesy of the final piece of dodgy marshalling at the pedestrian crossing next to Race HQ. At the finish line I just about manage to avoid having my eye poked out by a self stick carrying 5k fun runner (as below) and I’m all done in 42.30 in 6th place. Al got the W and Ben was 3rd. 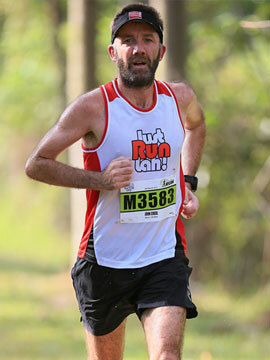 The Claw crosses the line in something like 12th, so it’s a good effort for the striders with 3 of the top 12 placings. 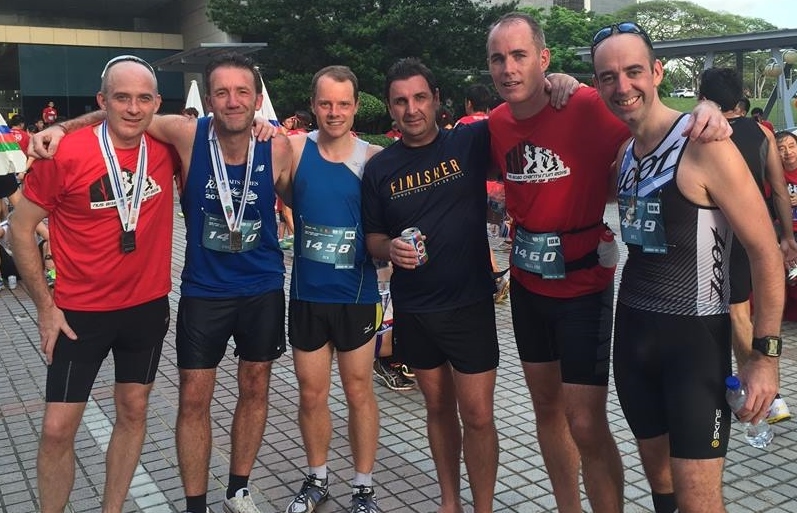 We wait for the rest of the gang with a can of F&N’s finest liquid amber (100plus – drink of champions) and reassemble for a post run striders photo. 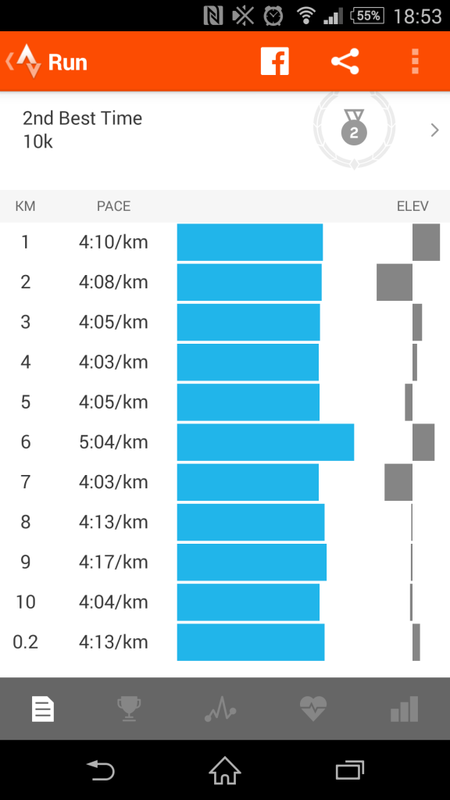 Despite some poor marshalling (just inexperience I think) I really enjoyed this one – it’s a small race, a challenging course, local to where i live and the pre/post race village had a nice vibe about it. As I understand, this and the other 10k at NUS are both run by student committees, which means there isn’t much continuity from year to year – and you can certainly notice that in the way these are organised – maybe they can try to have some folks stick with it for a few consecutive years – they could do with appying some ‘lessons learnt’!). But, the course makes such a great change to the boring flat marina bay routes that I will cetainly be back again for more, so I’ll add one point to the three points at the start – 4) bring a sense of humour and dont sweat the details. No racing plans for me in Feb, next time out looks like being the Green Corridor in early March, my favourite race on the SG Calendar. See you all there! 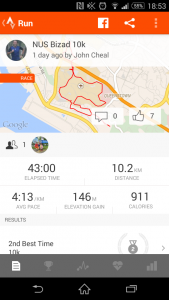 Nice review and a nice run to start the year – the steep steps incline was brutal indeed. 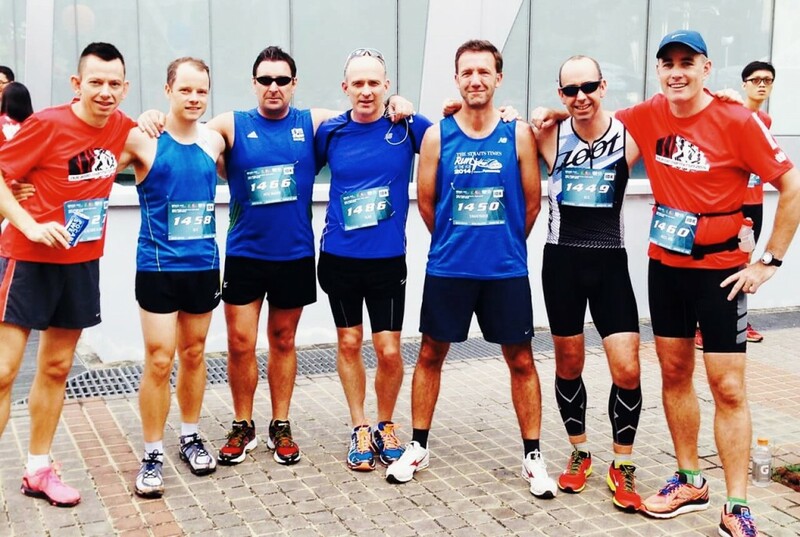 Sid, I agree – I spent the whole race back and forth between pavement and road – there are a lot of sections where the pavement is very narrow and there were still pedestrians using, so some time on the road was almost unavoidable! Yes, I agree. Last year the race started at 7-8am or so and I remember there being much less traffic on the course, and I think there was no 5k although I could be wrong on that. This year there was plenty of traffic of all descriptions – motorised, 5k runners, amorous couples and the general public, which obviously made it much more challenging. I also would have expected to see some more prominent signage warning cars/buses that there was a race in progress – I didn’t really notice anything. I would be in favour of a return to a morning start time I think, assuming NUS are not going to close the roads which is obviously just wishful thinking on my part. thinking about it, I cannot recall seeing a single sign anywhere on the route to indicate race in progress!